There’s a lot of information out there about what kind of touring bikes to ride and which panniers to use, but it seems to be pretty difficult to find out how much a long distance self-supported bicycle tour actually costs. You hear people talk about how they’ve spent less than $20, $10, $5 and even $3.00 USD a day, but it’s hard to tell what they are actually spending that money on because these accounts are usually not backed by a detailed expense report. Because this information is so difficult to find, I’ve decided to share with you exactly what I’m spending my money on while I am here traveling around Europe for the next five months. I’ve been here for a little over a month now, so this is the first of five posts I plan to share with you. If you are a new reader and are not yet aware of what I’m doing here in Switzerland, you may want to read this article first. I purchased a one-way ticket from Vayama.com for $505.40 USD (About 587.93 Swiss Francs (CHF)). That ticket got me, my bike and all my gear from Los Angeles, California to Zurich, Switzerland. If you are looking for good deals on one-way international flights, Vayama has some of the best rates I’ve ever seen. Back in October I found an apartment to rent via the Internet in Luzern, Switzerland and paid for it way back in November ’08. Nevertheless, the apartment cost me 1,200 CHF (or about $1,025.70 USD) for the month. This price included the cost of the water, heat, electricity, etc… and this apartment served as my home base for my first month in Europe. Once I landed in Zurich, I had to take a train from the airport to the city of Luzern where I would be staying. The train ticket cost me 27 Swiss Francs (or about $23.21 USD). While walking around town one day I strolled into a used book store and found a book that was written half in English and half in German. Because I’m trying to learn as much German as I can while I’m here (and because the book was cheap), I bought it. Total cost: 3 CHF (or $2.58 USD). This is the only luxury I purchased this month. Finally, I did have to purchase a few toiletries once I got here. I brought most of the necessary toiletries with me, but I did have to purchase a bottle of shampoo and some hand soap for the bathroom. These items cost 8.50 CHF (or $7.31 USD). If you divide that by 31 (because there are 31 days in the month of January), that would be an average of 64.33 CHF or $55.12 USD per day. My plan for January was to stay as cheap as possible by 1) eating foods from the supermarket and 2) entertaining myself with day-long bike rides to the neighboring cities and towns around Luzern. While I was able to stay relatively cheap in January, I suspect February is going to be a different story. This month I have two friends coming to visit me here in Switzerland and each of them is going to be here for around a week. During their stays, we plan to travel around by train (thus requiring that I buy a train pass), go skiing (buy a lift ticket and rent skis) and go out to eat (pay for overpriced food). While I won’t be paying for another airline ticket in February, I will have other items to pay for and I hope to keep my expenditures under $2,000 USD. Tune in next month around this time to find out exactly how much I spent… and to see exactly what I spent my money on. I hope this was helpful to you in some way. How could I make this information better? What more would you like to know? If you have any ideas, please leave your suggestion for me in the comments box below. 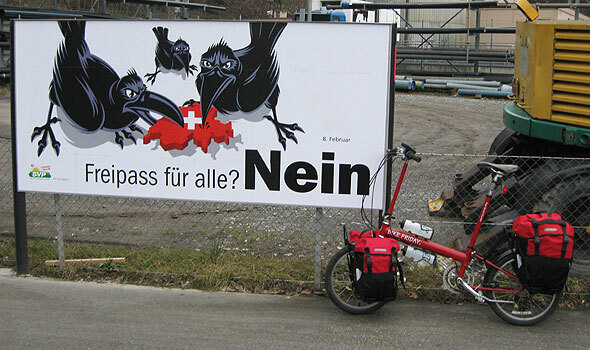 This entry was posted in Bicycle Touring Pro Articles, Europe, Lifestyle, Locations, Lodging, Main Articles, Switzerland and tagged budget for trip to switzerland, budgeting for a bicycle tour, cheap bike tours, cost of average bike tour, cost of month in europe, cost of one month in switzerland, entertainment costs, europe travel planning, food, grocery bill, luzern, one-way plane ticket, solo bike touring, swiss. On bicycle tours. If possible. Having a really nice dinner out to eat is amazing. I found cooking all my meals over the Jetboil was getting old fast. Especially touring in France, you can’t get away from all the great food they have! This was a very important part of the tour for me .. experiencing the local food. My partner and I also have Bike Fridays, and may be taking a trip to do the Rhine River trail — not decided yet — this summer. We plan to take our bikes in their suitcases and use those as our trailer for gear for the trip. Do yo have comments about using the trailers vs. panniers? I see you bought a one way ticket. If we go for one month, would you suggest a one way or round trip ticket? We would most likely start at the Amsterdam end of the trail and end in Switzerland. I don’t know yet how we would get back to Amsterdam (perhaps train?). Enjoy your trek, and I look forward to reading all about it. Do you have your February budget expenditure yet? For a one month bike trip in the summer, I think that hauling the Bike Friday trailer will be fine. There are some paths (if you choose to take them) that resemble that of a single track and the trailer may have some troubles there, but for the most part you will be on paved bike routes and should enjoy the ride. I simply chose not to bring the trailer on this trip because I was planning to travel for so long and because I wanted to have the option of going places that the trailer might not want to go. If I were you, I could get a round trip ticket if you know when you will be coming home. My trip is very open ended, so that’s the reason for the one way ticket. You will save quite a bit of money if you get a round trip ticket. Finally, I’ll be posting my February expenses next Tuesday. Check back then for the update. How is the world did you spend so little on food? That is our biggest monthly expense, at about $300 per person per month! Thanks for sharing! 1) I always shopped at the supermarket and avoided the extremely overpriced food that you get at restaurants and roadside huts, etc. I know a lot of people enjoy eating out, but when I travel by myself I don’t enjoy going to such places. I’ll only go if I am with company or have a friend. 2) Secondly, I looked for food that was on sale and/or was not a name brand product. For example, I bought bananas that needed to be eaten right away (saving more than $0.50 per banana). I bought organic carrots and potatoes that had been packed for discount in small plastic bags (saving a significant amount as well). And I looked for daily deals on foods like pizza, pasta and ice cream in the frozen food sections. Doing all this in addition to purchasing the cheaper grocery store branded products, I was able to save a somewhat significant amount. Keep up the good work Darren. It inspires us old tourists to get back out there and do it again with a current, realistic expense budget. I was wondering how to reduce my expenses as I am now past the camping stage unfortunately(73 in May) and will be Cycling the Eurovelo6 St Nazaire France to Constanta Romania app. 4500km. Hotels are very expensive in Europe however Hostels are fairly numerous which helps to reduce costs. I have noted your great tips on Supermarket food etc. many thanks for that. I am concerned about personal safety /security of gear Cycling alone especially through Cities and remote areas do you have any tips regarding that. Many thanks and keep up the GREAT service to us amateurs. If you don’t want to camp, but want to travel inexpensively, I would check out staying with some of the hosts on http://www.warmshowers.org and similar sites such as globalfreeloaders.com and couchsurfing.org. You might not be able to find a host for every night of your bike tour, but even staying with a few of these hosts during your travels can help to reduce your overall costs quite a bit. I want to travel to Ghent, Belgium and Nice, France this summer to ride my bike around the legendary roads of Europe. My plan is to stay with different families by joining the WorkAway website. This would take care of my housing costs and possibly my food costs depending on who I stay with. My question though would be if I don’t have food costs taken care of how much do you think I would spend on a daily basis concerning food costs. I certainly don’t mind eating beans and rice. You can by in Europe on about 10-15 Euros per day (if you are on a budget). I would aim for somewhere around there. Much less than that and I think your diet might be unhealthy. You need to eat well when bike touring! You’ll be expending a lot of energy… and I want you to feel good!